The entirety of black geekdom simultaneously caught the Holy Ghost on Thursday when Marvel released posters for some of the individual characters in the movie that already has black people practicing their “I’m ’bout ta die” voice so they can call in on Feb. 16, 2018. 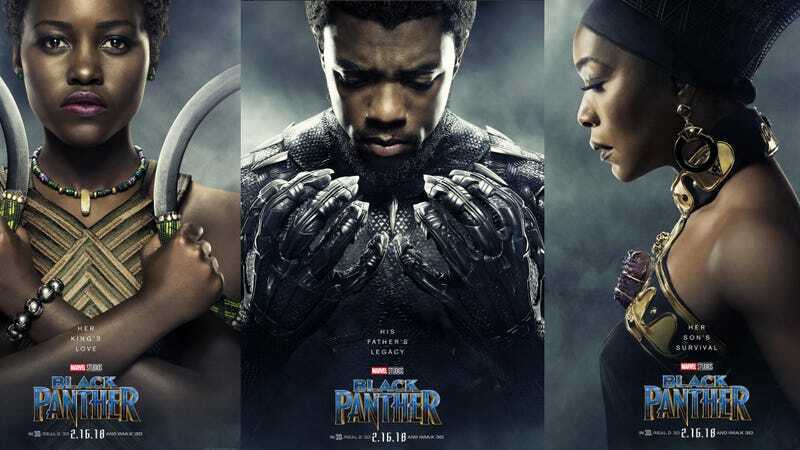 First of all, Chadwick Boseman’s poster as Black Panther is everything we hoped it would be, even if he looks a little bit like Dwayne Wayne from A Different World. But who’s to say Black Panther didn’t go to Hillman? That’s probably where all that rage comes from—waiting in line to register for classes. And I know they say black don’t crack, but never? Is Angela Bassett destined to look as if she’s 27 years old until 2098? It must be that clean drinking water in Wakanda. Can we just pause for a moment and bow to Lupita Nyong’o’s beauty and grace? And swords? She has circle swords, y’all. Forest Whitaker was in the Star Wars prequel and now this. Or maybe Rogue One wasn’t a prequel. I get confused. Look, I know you’re waiting for me to make some kind of Forest Whitaker side-eye joke, but we’re better than that. It’s great that Michonne finally escaped Negan and made her way back to her people. I bet she didn’t tell anyone that she was shacking up with a white police officer, but hey, you gotta do what you gotta do in a zombie apocalypse. Marvel hasn’t released any information about whether or not these posters will be for sale, but I bet you can buy one at the Spencer’s Gifts in the Wakanda Galleria. Man, I’m so ready to see this movie, I can’t stand it! I gotta go now. I need to practice my coughing for Wakanda Day 2018.